View this map in full-screen mode. The Stz’uminus Storied Places Digital Atlas research project with the Stz’uminus First Nation in Ladysmith builds off an earlier initiative involving the Stz’uminus First Nation and Project REEL Life, which engaged Stz’uminus youth in digital story telling and spawned regular outings where Stz’uminus youth recorded HD video of their Elders. The research project ran from 2013-2017 and introduced a focus on Hul’q’umi’num’ place names and works to bring these place-focused videos into digital maps, so community members can continue to listen to the names and stories via desktop computers, laptops, and, particularly, mobile devices. 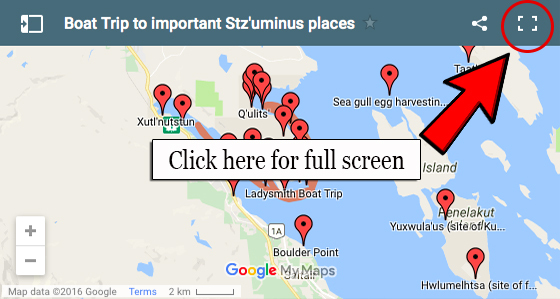 the collaboration for the Stz'uminus Storied Places project was covered in the news by The Globe and Mail (July 2014) and in UVic's newspaper The Ring (March 2014). The objective of this project is to mobilize traditional knowledge of Stz’uminus territory and place names shared by Elders through a youth-involved, community-based video stories project and, subsequently, a digital map. The outcome of this research will be video stories plotted to an interactive digital atlas, available for use by the Stz’uminus First Nation and, upon review and approval by the Nation, the general public. There will also be an evaluation of which digital mapping platform is preferred on a smart phone interface. 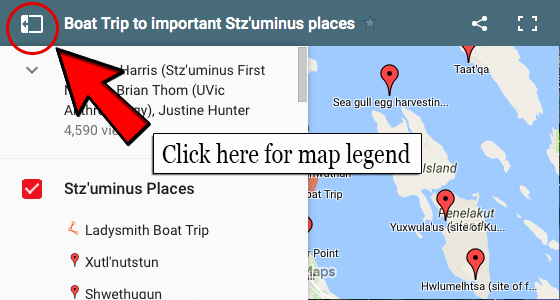 Collaborative project with Stz'uminus First Nation, with UVic student Amy Becker and Dr. Brian Thom, to create an annotated video-enabled digital atlas of Indigenous place names using Google Maps Engine. Indigenous place names on the digital atlas are made available on mobile devices through Google Maps Engine. Use the legend to navigate layers and sites. 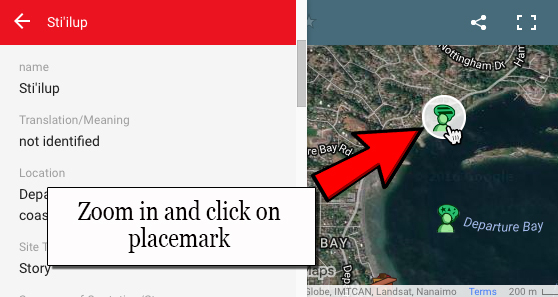 Or zoom in (double-click anywhere on the map) to see placemarks more closely; click on a placemark for more information. Go into full-screen mode for larger viewing area.